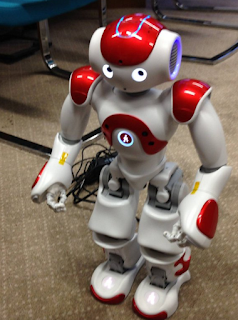 I managed to do something I have want to do for a long time this week, thanks to the recent purchase of NAO robots by the University of Northampton, I have managed to include a physical example of Social Robots into my teaching. The aim of the session was to teach about social AI, revolving around the using social cues, to a certain extent, using natural language through chatbots, for us to communicate with machines. The robots were used as an example of a social robot, the way we want to play with or work with them, without having to going through a steep learning curve on how to use them. Students were encouraged to consider why this was and that anthropomorphisation plays a part (NAO basically has some of the characteristics of a small child). The fact that it responds to voice commands, its looks, has a childlike voice, that it always moving (even slightly when standing) and the way it moves; were spotted by the group as ways it attracts us to it - it is really hard not to talk to it like a child sometimes (but perhaps that is just me). This session also included the use of chatbots (one example, ALICE used is shown here) and AIML, Artificial Intelligence Markup Language, (a link to more about AIML is included below). Just as a bit of background, chatbots (also called variously, chatterbots, conversational agents, etc) are programs that hold a conversation with us using through either text or speech. The chatbots were used to show how we can create intelligent-like behave by in effect providing responses to questions. Followed by, how we then take this further by using the responses people give, while using the chatbot, to 'fine-tune' the model. ALICE http://alice.pandorabots.com/ (the one shown in the picture above). A good source of further examples can found at https://www.chatbots.org/country/uk . chatbots is one of the biggest thing in business. chatbots in marketing is one among the usage.